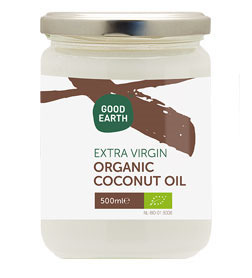 Good Earth’s Organic extra virgin coconut oil has a very good resistance to high temperatures so makes it ideal in the preparation of all dishes, vegetable, meat, eggs and cakes. Coconut oil is considered the healthiest cooking and frying oil due to its high content of medium-chain fatty acids. The fats (lauric acid) in coconut oil have nutritional properties very similar to those found in mother’s milk. It also has a protective effect on brittle and damaged hair and can be used as a moisturiser to help regenerate and soften the skin. © 2019 Mangion & Lightfoot, Ltd.